Writing Up an Appetite is going on a summer hiatus, but not before we thank all of our wonderful readers, everyone who took the time to leave comments or to share our posts, and especially our guest bloggers from the past eleven months. Below is a list of all 46 Writing Up an Appetite posts so far, listed by author. In them you will find not only yummy recipes but creative inspiration for your writing, ideas for cooking for and with children, and more than a little memoir and nostalgia. May your summer ooze with pleasure. It's the eggs that bring me down. 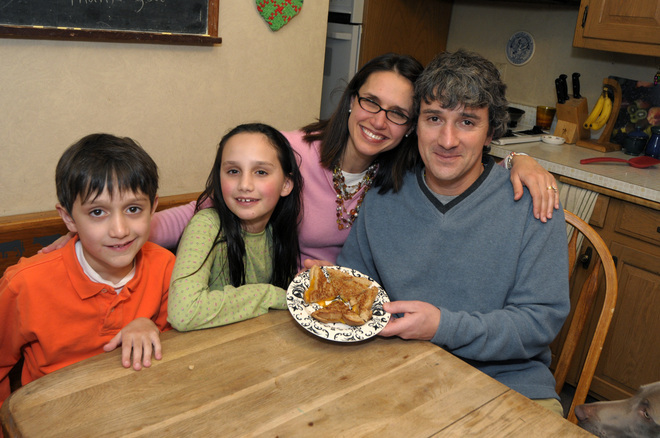 From Marie Callender to homemade, there was always Chicken Pot Pie. 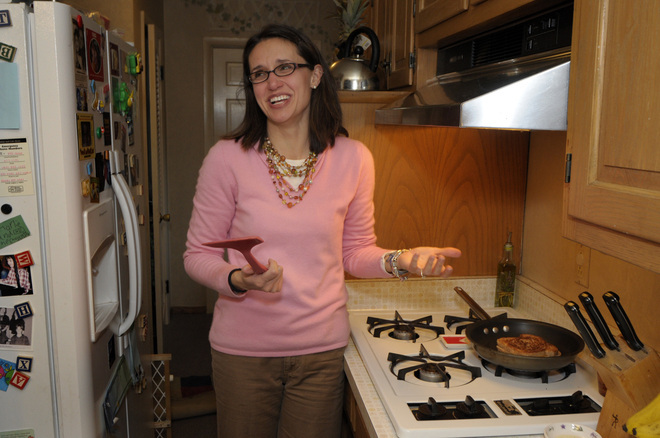 On Food Allergies: A sneak peek at a memoir, a chance to win the book. My love affair with coffee. What to do with the chicken bones? Pam Parker: Too Hot to Cook? Sarah (Celiac in the City): Day trips and pumpkins lead straight to the kitchen. We should have fruit soon, if the rabbits don't nibble them clean first. Vegetable-ready. This summer will be the first time in a long while that we try for a garden. And there's plenty to share. Potential. It's everywhere. In the first signs of the season, in the rich soil overturned, in an uncomplicated recipe that yields the best dessert. A pinch of willing, a scoop of desire, a cupful of determination; that's my strategy for tackling summer projects. What are you cultivating over the next few months? * My version of Lisa's Poor Man's Cake. Click here for her post and the recipe, then pass it on. Give it all a good and tender cooking, stirring to keep the potatoes even and fine, but before they're too soft, toss in sliced black olives and button mushrooms. Let it simmer for a minute or two, then add a lot of fresh spinach. Fill the pan with fresh spinach and let it cook down. Covering the pan helps steam it a bit. Sir it up and add more spinach until you run out. Give it another good stir and drop in two eggs if you made a lot. If you were feeling nervous, only add one. Check your taste buds and toss in some basil and oregano to boot. When the eggs are blended and cooked, and the potatoes are nice and tender, take the pan off the heat and throw in gobs of crumbled feta cheese. Stir it up. Stir it up. Now you need pita pocket bread, cooking spray, shredded Parmesan cheese and a baking sheet. Stuff the pita pockets with the potato filling and let them make merry, laying each out on the baking sheet with a fine dusting of cooking spray and Parmesan cheese. Place them under the broiler just long enough to turn the pitas a warm, golden brown. Serve with a generous helping of tzatziki sauce. This was my first recipe, seventeen years gone and I still cook it up to warm my husband's belly. The first time I made it for him was at two-thirty, early, on a Sunday morning, after dancing and drinking at our best goth-industrial club on the far east side of Madison. We smelled of clove cigarettes and the cool, unnamed scent that radiates from fog machines. I was tired, keyed up and hungry. So early in the morning, I cooked as if on a dare. The last time I went to that club I felt my age surrounding me like a helpless aura I couldn't shake. I was married with two kids and years past thirty. I could still dance the hours through, but the morning comes faster now with eager faces pulling at the sheets. Meals like this are done with more respect to time and energy. They're planned ahead, thought out, and served with a cold glass of 1% milk. Was April the cruelest month for you? Mine wasn't cruel, but it was definitely a stormy whirlwind of missed deadlines and too many balls in the air, too many irons in the fire, too many cooks in the kitchen, or whatever other cliché that comes to mind. I'm guessing your April wasn't much different. And now it's May (! ), and rather than feeling caught up and ready for a new month, I'm looking at an overdue list that is nearly as long as my to-do list (and my want-to-do list must wait a while longer). It's time for some kitchen therapy. Nothing helps me to focus on the moment, appreciate what I have, and get my hands back into life's pleasures better than taking the time to cook or bake slowly, with intention. No phones. No email. No music, even. Just me and ingredients and the promise of creating from scratch with nearly immediate gratification. The yellow tint to the milk is from an early version of the scone recipe, below, where I tried to use part olive oil, part butter. Edible but not publishable. Don't try it at home. The history of scones goes back at least six hundred years (see the fascinating Food Timeline site for origins and recipes), so when I use my fingers to "pebbalize" butter into soft, sifted flour, I imagine myself connected to cooks from centuries past, putting their hands in barley meal and shaping rounds or squares or triangles to be baked on hot "girdles." 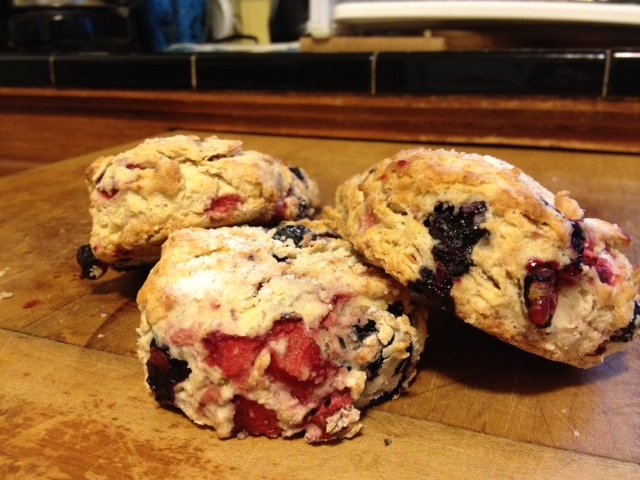 The following recipe is adapted from instructions for "How to Make the Perfect Scone," with some help to convert grams to cups and Celsius to Fahrenheit. This version combines simple ingredients with fresh berries and uses no added sugar, unless you choose to sprinkle some on top. Here's wishing that April showers bring May flours for us all. Add the cold butter pieces to the flour mixture, and use your clean, dry fingers to rub the butter into the flour until the butter pieces are no bigger than tiny peas. Trust me: this feels good. Add milk or cream, and stir mixture very lightly until almost combined. 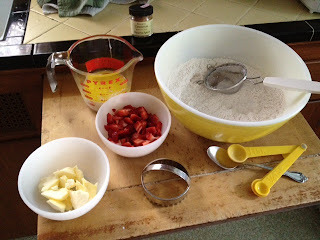 You don't want it at all to reach the stage of batter, and there will still be some unmixed flour. 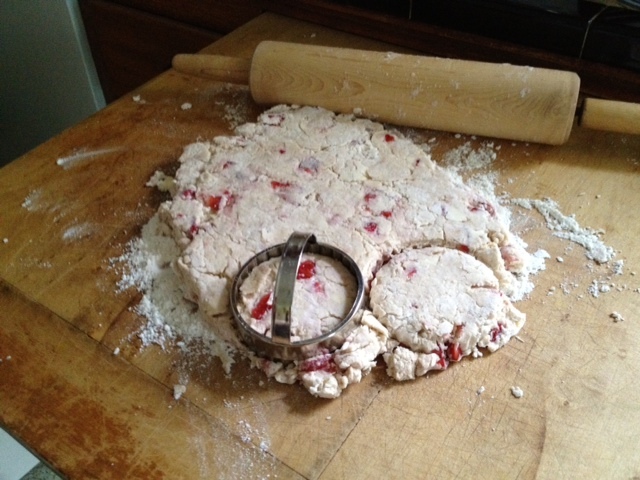 Add the evenly berries, and use floured hands to fold them in and gather the entire mixture together into a big, soft lump. Transfer mixture to a floured surface, and gentle pat or roll to a thickness of about 3/4 inch. Cut into ten to twelve rounds or squares. 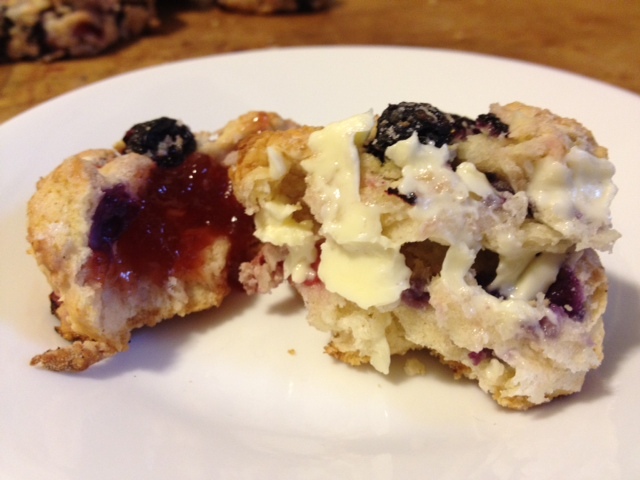 If you wish, brush the top of each scone with milk and sprinkle with sugar. Bake scones on a baking pan or stone for 15-20 minutes, until lightly browned. "I am so sorry to hear about your wife; I never knew!" That's the kind of repsonse my husband heard after my dirty little secret came out. I guess it was a tragedy to some. I didn't know how to cook. I have no one to blame except myself really, not for the cooking part, but for the secret getting out part. You see, I busted myself, and big time. Two years ago, our newspaper had a "want ad" so to speak. "Do you burn water? Are you clueless in the kitchen?" The ad was talking directly to me! Our paper wanted to do a 'lousy cook' story, to show that even the worst of the worst could learn. Our grand prizes were cooking lessons with local chefs, and let me tell you, I had the time of my life! I got to learn how to make so many yummy things with Chef Peggy Magister of Crazy Water. The biggest lesson Peggy taught me was how to cook with passion and joy. She combined so many amazing things and had so much FUN! I saw how cooking could be a creative experience. I learned how to make killer Spinach Lasagna from Chef Juan Urbieta of Ristorante Bartolotta. I actually have people ask for a recipe for something that I made! Making desserts with Kurt Fogle of The Pfister Hotel was an absolute delight. I made a soft-centered chocolate cake that had a soft center on purpose! Finally, the amazing staff at Milwaukee Area Technical College taught me the basics. All of the professionals that worked with me were so kind and reassuring. This cooking thing really wasn't so scary at all. I just had to have fun and give it all a try. I really learned to be fearless. Overall, that is the lesson I want my kids to remember from this experience as well. Their mom didn't know how to do something, so she learned how. It's never too late to learn. I don't know if I would recommend airing all of one's failings so publicly, though, unless you want to be reminded of it from time to time. It's now two years later, and at least once a week someone will still ask me, "How's the cooking going?" Most recently, I was asked by all five of the voting ladies. "She won a contest you know." Cooking is a learning process, that's for sure, but I am having a lot of fun. Right after all of this silliness first happened, my 8-year-old daughter said, "Maybe you could get cleaning the house lessons, too!" Okay, I think I am done sharing my dirty little secrets! 1. Make fresh tomato sauce. 2. To assemble lasagna: Preheat oven to 375 degrees. 3. In a nonstick skillet, heat the 3 tablespoons olive oil over medium heat. Crumble and quickly brown the sausage for about 1 minute, stirring with a wooden spoon. Add spinach to skillet (it will seem like a lot at first) and season with salt and pepper to taste. As soon as spinach begins to wilt, turn off heat. 4. Lightly drizzle a 13-by-9-inch pan with olive oil. Evenly spread 1 cup of the fresh tomato sauce over bottom of pan, then lay down four sheets of lasagna pasta to cover bottom of pan. Over the pasta layer, once again evenly spread 1 cup of tomato sauce, then sprinkle on half the browned sausage-spinach mixture, distribute a third of the ricotta in small spoonfuls and sprinkle on a third of the Parmesan cheese. Repeat this process, starting with a new layer of pasta but this time using six sheets and slightly overlapping the pasta. 5. To finish assembling the lasagna, lay down and overlap the last six sheets of pasta, spread on the last 2 cups of sauce and the remaining third of the ricotta and Parmesan cheeses. Finally, cover the lasagna with the mozzarella; break off small pieces from the balls of cheese and distribute evenly over the top. 7. Remove from oven and let lasagna set 10 minutes before cutting. Serve immediately with a drizzle of good olive oil. Note: Urbieta used the small mozzarella balls sold in tubs. A few weeks ago, I stopped in at the doctor's office for a prick of my finger and a surprising revelation. "You're a little anemic," the doctor told me. This might explain, as I understood him, why I would get out of breath so easily walking a flight of stairs, why I would arrive home at two in the afternoon and think only of sleep, sleep, sleep. I had hoped he'd mention something about how a low iron count would also explain my inability to jump-start a simple exercise plan. However, I suspect that issue has more to do with "lazy" and "stubborn". At any rate, I left the doctor's office and headed straight to the store for supplements. Here's the thing, though. Vitamins are my nemesis. Toss back head, one...two times. Follow with a tight fist, a foot stomp, and the hard crust from a piece of toast. It's the same every time, so dramatic that my kids join in the fun, imitating me in the middle of a head toss. Since I manage to take only half the recommended amount, I boost my iron in other ways, including one that fires up my Texas roots and honors my grandmother: cooking with iron. When I got married, one of my friends gave my husband and me a big cast-iron skillet. There's something primal about a cast-iron skillet. You're not messing around when you've got one sizzling on the stove. Mine has seen years of cooking, off and on, but it hits the gas flame much more often these days. This post on Kitchen Daily lists three healthy reasons to cook with iron, one of them being that meals made in skillets really does increase your intake of a necessary mineral. "While cast iron doesn't leach chemicals, it can leach some iron into your food ... and that's a good thing. 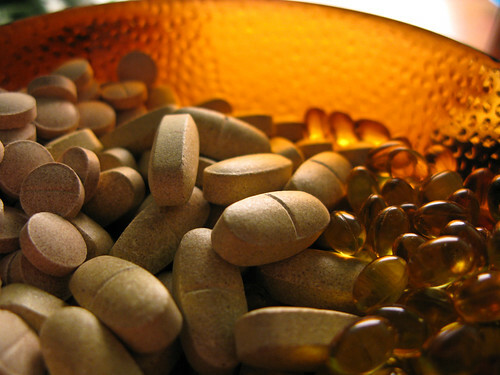 Iron deficiency is fairly common worldwide, especially among women. . . . Cooking food, especially something acidic like tomato sauce in a cast-iron skillet can increase iron content, by as much as 20 times." I cook plenty in my skillet, including tomato sauce. But, this week, I fried up some Catfish. Catfish is (surprisingly) one of the dishes my son will eat, willingly, so I cook it up knowing I'm killing two birds with one stone: fortifying my diet and tempting his taste buds. Catfish is easy to make, as long as you pay attention, and frying it in the skillet makes me feel old school and Texan all over again. In a mixing bowl, stir together cornmeal, cayenne pepper, paprika and onion powder. Mix well. Pour mixture onto a large sheet of waxed paper. Pour milk into a medium bowl. Dip catfish filets into milk and hold up and let the milk drip off. Roll the milk-soaked filet in the cornmeal mixture until completely covered. Set aside. Fry the garlic in the hot skillet, but do not burn. Add the coated catfish filets and cook for 5 to 7 minutes on each side, sprinkling salt on the fish after each turn. Cook until golden brown and fish flakes easily with a fork. Drain on paper towels. One note, if you make this dish, get everything set and ready to go before you start frying. When the recipe says "do not burn" the garlic, that means watch it close. Really, you only want to let it cook for a minute or two before dropping in your catfish. For some real Texas fun, cook up a batch of hush puppies for the side. How do you measure up with your iron? And, what do you do to make sure you get enough? *Vitamin photo credit: bradley j on flickr.com. The catfish is all mine. At one point I practically lived off feta cheese, spinach and Kalamata olives. Those were the days I worked in a cube farm with charcoal walls and windows about a half mile away. I was so healthy people said while I constructed enormous salads in the breakroom and pinned sarcastic notes to the freezer about food nabbing and socialism. That's were I watched the I.T. guy burn down the microwave with a take-out pizza box lined in foil. I think he still owes me for not ratting him out. It's not that I was so healthy, it's just that I got sick of vending machines and restaurants and the money, money, money of eating at work, and I realized that lunch on the cheap also meant carrying it in. The thing is, I didn't bring a proper sack lunch. I've been vegetarian for I don't know how long and sandwiches were more of a hassle than I wanted to deal with. So I decided on salads--huge salads decked out in grape tomatoes, sunflower seeds, olives, feta, hard-boiled eggs and vinaigrette dressing on a bed of baby spinach. If I piled enough stuff in the bowl I wouldn't have to look at the egg salad sandwiches and plain white bagels riding around and around in their electric carriage; I could sit at my desk with headphones on and listen to something sinister by Clive Barker while obsessing over wedding cakes and Pacific Northwest treehouses. There's something wonderful about working in a mindless job gnashing out minute by minute in pointless abandon. I had my first NaNoWriMo behind those charcoal walls. Later, when I managed my own team of misfits and Death Eaters, I wrote a few short essays and started up the Team Evil zine. Fifty hours of structure can kick out a good lot of creative energy if you have a mind for it, and I'm pretty sure my mind was starving for a formative kihap. I'm still a huge fan of the spinach and feta fandango, but with two kids at home and a constant need to keep the food lively and inventive, it doesn't get as much play. These days we're into anything that can be made into the shape of a face, a rocket ship, or an animal. Also anything made from fruit, blended or frozen, or whipped into a muffin and toasted in the oven will do. Still I keep feta on my shopping list and spinach in the crisper for nights like this, when I get a hankering for an old recipe misplaced at the bottom of the box. 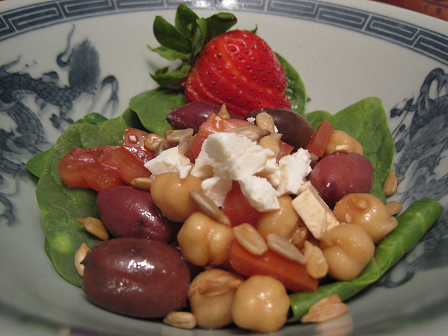 Mix ingredients in a bowl and serve over a bed of baby spinach. Be sure to wear headphones and listen to a compelling audio book of your choice. Create something beautiful. Be a Follower for a Chance to Win One of These Books! One title will be given away when we reach 50, 100, and 150 followers. 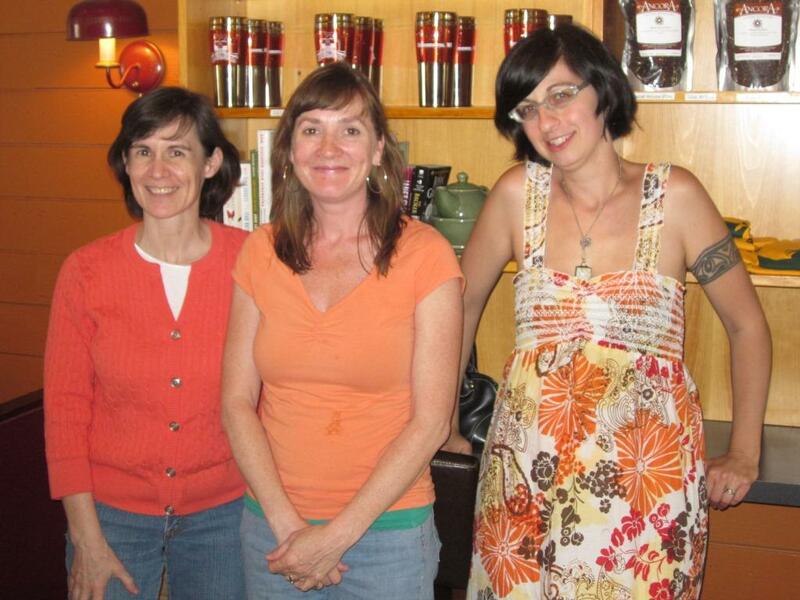 "cooking helps me to write"
Three Wisconsin friends and writers take turns every Tuesday sharing recipes and thoughts on food, cooking, and eating, with occasional garnishes in between. Bon Appétit!